Qi Yun and I spent our weekend at Hotel Jen Tanglin. An invitation to Sunday Brunch at Hotel Jen Tanglin was the best moments of our weekend. The food was spectacular and the spread was so huge it was one of the rare times I didn’t know where to begin the meal! A glorious platter of fresh salmon and tuna sashimi. I love sashimi! These slices of fresh fish had just the right texture and sweetness, and with a dollop of wasabi and soy sauce… It tastes heavenly! And just so you get how fresh it is, the kind staff of J65 have placed an emptied-out fish to make their point. If you are a cheese lover, you have got to get this Stilton Blue Cheese. Infused with the sweet taste of port wine, this cheese gives a flavourful burst that leaves you wanting for more! It’s just one of the many types of cheese you will find in J65. Feast your eyes (and your tastebuds) on this gigantic Signature Chicago Bull Leg! It will fit right in a Flintstone’s movie. A chef will help serve you with these savoury slices of meat. With a tinge of red, the meat is cooked for 14 hours to achieve the well-marinated outsides and perfectly roasted tender insides. With the huge Chicago Bull Leg around, you might just miss the Yorkshire Pudding by its side (I did…). Pair the sweet and crispy Yorkshire Pudding together with the chewy and ‘beefy’ meat for a journey straight up to the heavens. We could hear the ‘crackle’ sound clearly as the chef cut open this dish (watch the video below!). The Pork Loin with Stuffing was absolutely yummy and we loved how crispy the skin was. Munch munch munch! If you love your alcohol, here’s some great news for you. Sunday Brunch has free-flow champagne, wine, beer and cocktails so you can drink to your heart’s content! Pictured here is a concoction of Bloody Mary that made its way to our table. J65 has not forsaken desert lovers too! There is a good selection of deserts – from cakes to kueh! Qi Yun and I had a hilarious time making our own green tea ice cream, making full use of their plentiful toppings in the name of Christmas indulgence. There’s so much more J65 has to offer during the Sunday Brunch it’ll be impossible to cover it here. Better to hop on down to Hotel Jen Tanglin and see it for yourself! While enjoying your sumptuous meal, you can also soak in the modern yet cosy atmosphere. Qi Yun and I thought that the staff customer service was pretty good. It seems as though the waiting team are all full-timers who have been carefully selected and trained to provide impeccable service. The staff are always smiling, and somehow manage to stay out-of-sight when you’re eating. Leave an empty plate on the table and someone will ask if you will like to clear it pretty quick. Perhaps the fact that we’re sitting in a very visible area near the lobby helped. Nonetheless, great service from the J65 team! When you are there, take a closer look at the uniforms of the J65 team. These are meticulously handcrafted artisan aprons that were conceptualized by local designer FIN and commissioned specially by Hotel Jen Tanglin to promote home-grown talent and skill. Take a close look at the finer details all around the hotel and you will be impressed by their tenacity to support local talents. Love it! To top it all off, you’ll even get to enjoy a live DJ performance as you munch on your Sunday Brunch delicacies! Be sure to make a trip down before the Christmas specials disappear! We really enjoyed ourselves lots at J65. Coming from the same vein, their F&B team has kept the impeccable standards of Shangri-La Hotel, while bringing in unique experiences at greater value. A tremendous amount of work goes into their F&B outlet. Did you know that for every single dish, in every single meal, a sampling of the food is kept for a few days? This functions as a crisis management tool. For example, in an event of food poisoning, J65 is able to provide its food samples from a specific day and meal for analysis. This allows authorities to easily trace the roots of the disease and facilitates J65 in implementation of preventive measures. That’s called dedication! The Sunday Brunch is available every Sunday from 12noon till 3pm at SGD 138 net with free-flowing Champagne, wine, beer and cocktails and SGD 98 without alcohol. Do note that the prices are net, meaning you won’t need to factor in additional costs such as Service Charge and GST – another pleasant initiative by Hotel Jen Tanglin to provide better experiences for their guests. You may also enjoy J65’s meals throughout the entire week. If you’re looking forward to a meal at J65, here’s a sweetener. Reserve a table at https://www.hoteljen.com/singapore/tanglin/taste/restaurants/j65/ and get an exclusive onling booking discount of 15% of the total bill. Awesome! All in all, we spent about 3 hours dining at J65. We enjoyed ourselves thoroughly and we’re sure you will too! Right next to J65 is a quaint 24hour café, Jen’s Kitchen On-The-Go. The first thing you’ll notice in this cosy corner is a table set on top of a bicycle. Just one of the many quirky encounters you will have at Hotel Jen Tanglin as part of their initiative to support local artists. As a guest, you can even rent a bicycle to explore Singapore’s streets on two-wheels. Be sure to request for a GoPro to loan from the hotel staff when you do! As its name suggests, Jen’s Kitchen On-The-Go is perfect for takeaways or a quick bite – from sandwiches to ready-made meals such as the ‘Apple-wood Smoked Salmon’. If you prefer to get a quick bite and spend more time adventuring the streets of Singapore, this is the place to go to. Besides the usual coffee you can also get a wide variety of drinks – from juices to alcoholic ones. That being said, it’s also a great place to chill and relax with a good book in hand, you don’t always need to buy things for-the-go! Unlike cafes in many other hotels, Jen’s Kitchen On-The-Go has done away with large-scale wholesalers and have opted for local distributors instead. As such, they have a very unique selection of coffee to choose from. For the tea and coffee aficionado, you can even buy the roasted beans and tea blends to take home! We spent about half an hour simply sipping coffee and people-watching at Jen’s Kitchen On-The-Go. It truly has a lovely ‘chillax’ vibe to it, which I enjoyed tremendously. Do check this place out when you’re in the area! Our host also shared with us about Hotel Jen Tanglin’s Christmas order menu. We thought that it’s a pretty good offer and will like to share it with you. Christmas is the perfect time to share a happy meal of turkey and trimmings with the family. 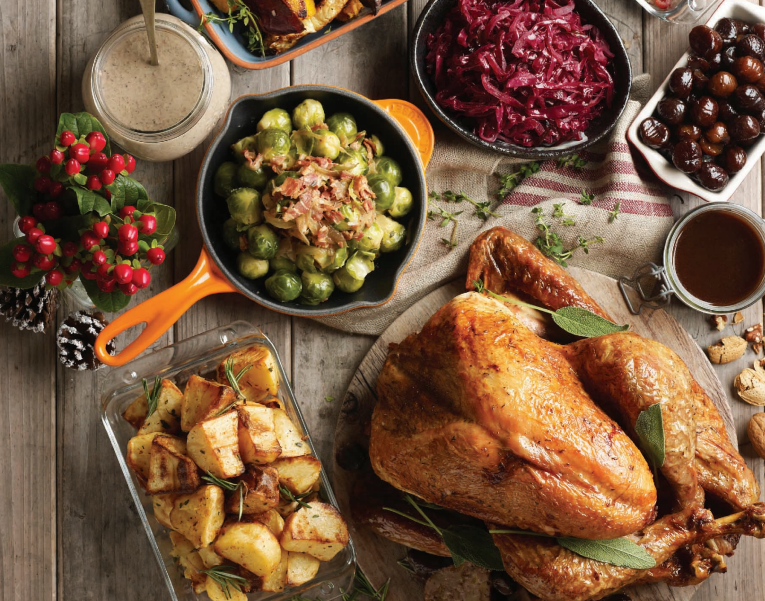 To help you do just that, Hotel Jen Tanglin has launched a bespoke Christmas order menu that places the trimmings (not the turkey) in the limelight! With all these Jenerous portions of trimmings, your Christmas turkey becomes that much more savoury. We’ve tasted the turkey during J65’s Sunday Brunch and it was more than worth the amount you are paying for! Orders are priced at SGD$198 (instead of $300 if you were to buy the ingredients on their own) and must be made 48hours in advance. Do call 6381 4295 or email trimmings@hoteljen.com.sg for orders. The Christmas order menu is available till 30th Dec 2015.